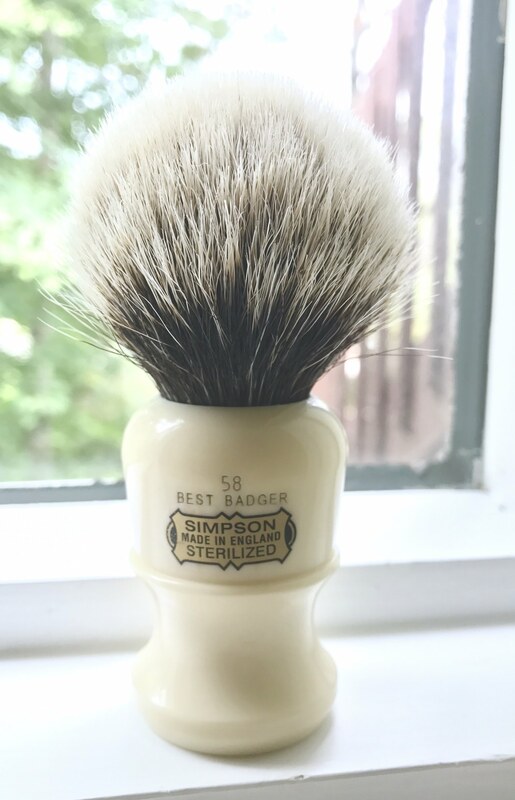 Since the great sale is going on at Bullgoose, I wouldn’t mind picking up one of the 50s and since I face lather exclusively I’d like to know which might have the best handle for it. 58 or 59 for me. I just traded a 58 that was a perfect middle of the road size. It was good for either face or bowl. Wait one minute. HOW is that Best Badger? In the past Simpson occasionally offered 2 band brushes. Not a high volume item, so they typically used available handles that were either "best" or "super" labeled. The 58 shown above is such an example. It dates from 2011 and is part of the famed 2 band batch Simpson offered between 2011-13. I think the 58 is a very reasonably sized brush. I have it and find it just right personally. I believe I had a 59 for a time and found it too big then, but I think I'd be fine with it now. 58 sold out fast with the great sale. Oh well, always next time. (12-03-2017, 06:38 PM)tsimmns Wrote: 58 sold out fast with the great sale. Oh well, always next time. Consider the 59. It's my favorite of the 50 series. I may have one in the display case and will check tomorrow. (12-03-2017, 07:35 PM)tsimmns Wrote: Sounds good Phil. I find the 57 actually closer to the size I use most often.